Last month, I was awarded The Fabulous Sugar Doll Blogger Award by friend, writer, literacy enthusiast and fellow blogger, Hema Penmetsa. (I was right in the middle of too many projects at the time, so Hema graciously suggested I “sit on it” for a few weeks and then “claim” it whenever I could! Check out Hema’s fantastic blog, Wading Through Words. I am truly, deeply honored that someone appreciates my writing enough to give me an award! The challenge? Selecting 10 things to reveal about myself that others might find interesting. Many of my readers are friends and family, and I’m a rather transparent person, but I’ll certainly do my best to share some interesting tidbits. Then, at the end of my ten, you’ll find out how I fulfill task number two… that’ll be easy! 2. Growing up I was a total tomboy! My bother (Jake) and my cousins (Nate & Ryan, whom we lovingly refer to as “Cousin-brothers”) can attest to this fact. I loved to run, romp, dig, bike and play with the guys just as much as I liked playing with my girl friends and cousins…and for the record; I NEVER liked playing with Barbie dolls! 3. I had a rockin’ sticker collection at the end of grade school. Looking back, it was a rather silly collection because I never really “used” the stickers for anything much fun…I just loved having “rad” stickers in a sparkly binder to drool over every now and then. 4. As a child and adolescent, I loved playing soccer; when I was in high school though, there was not a girls’ team. So, I went out for the guys’ team and was the first girl in the history of Farmington High School to make it. Fun times! I’ll never forget playing out-of-town teams for the first time…many opponents would take it easy on me until they found out that I would “burn” them just as fast as would any of my teammates. But, you can bet they were a little miffed when it happened…after all, I was a girl! 5. My first car was a hulkingly huge brown Ford Bronco and I got my driver’s license on my 15th birthday. My BFF, Dana, and I lovingly called her “Brown Bertha.” Along the lines of being a licensed driver, I’ve had more driving years than non-driving years in my life! Ugh. 6. I live with an Auto-Immune illness called Ankylosing Spondylitis, which is a cousin of Rheumatoid Arthritis. Many of my joints are affected and I self-inject medication. I was diagnosed about 7 years ago but was likely suffering from it in my late teens when I started having back pain that never quite went away. I am also gluten-intolerant; Celiac Disease (another auto-immune disease) runs in my family. But, as a result, I can bake a mean Gluten-Free chocolate cake! 7. While I love living in Texas to a certain degree, I secretly dream of moving back to New Mexico to be near my family; it kills me not to see them more than a couple of times a year. But, honestly, I’d settle for southern Colorado so that I could make weekend trips…in addition to missing my family, I also missing having actual seasons (like, four of them instead of the two in Texas…winter and summer.) The mountains and valleys call my name on a regular basis. Texas is rather flat, you know? I miss New Mexico! 9. When I was in college (learning to be an educator), I always thought I’d go on to obtain several graduate degrees and eventually teach at the collegiate level. These days I can’t even fathom going back to school. However, I am constantly learning! Because Ethan, my only child, lives with Asperger’s Syndrome (an Autism Spectrum Disorder), I almost always have a book in my hand, a documentary to watch, a new blog to read or something powerful I feel empowered to write about regarding Autism. Recently when we went to a movie at our local AMC theater, there was an advertisement for the AMC Sensory-Friendly films (now showing across the country in association with the Autism Society). Ethan heard “Autism,” looked at me with the sweetest, most innocent, excited face and said, “Mom—Autism! YOU could help them with that!” Oh how I am blessed! 10. Before becoming a mother, I didn’t truly understand how deeply profound and fully encompassing love could be. My son is an amazing gift; I have learned more through him than I ever knew was possible! Through motherhood, I have also developed a new-found respect and love for my mother. Family is such an integral part of who I am, who I’ve become and who I want to be. Now, drum roll please…it is my pleasure to pass The Fabulous Sugar Doll Blogging Award along to fellow mom, and Dallas Moms Blogger – Amy Twomey. Amy’s personal blog “i am a celiac,” incorporates her beautiful photography with all sorts of great information about living Gluten Free. Congratulations, Amy! 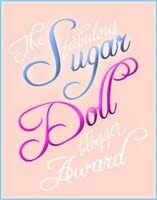 You are the next Fabulous Sugar Doll Blogger! Hema and Amy, thanks for inspiring me and motivating me through your blogs on a regular basis. Readers, thanks for reading, commenting and always managing to provide encouragement when I need it most. Leigh, you definitely deserve the award. Like I mentioned before, I truly admire people who not only face adversity squarely, but also turn it around and become a blessing to others. And thank for such glowing commendations for me and my blog!! You were a tomboy growing up? So was I (and it was one of the things I listed in my 10 things :)) — I guess there was a reason why we gravitated towards each other in a crowd! That was a beautiful list you came up with, and I feel like I know you so much better because of them.